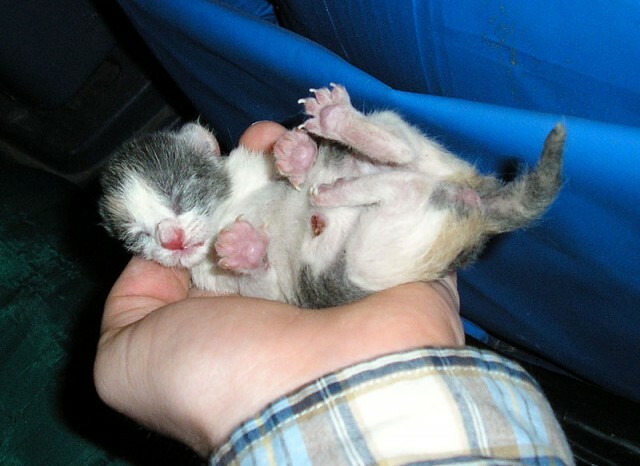 Contrary to popular belief, touching newborn kittens is unlikely to cause their mother to reject them. When a mother rejects a kitten, it’s usually because the kitten is ill or has a congenital defect that reduces its survival prospects. This is sad, but she has to put her energies into raising the kittens that are more likely to thrive. A mother cat may also reject her kittens because she is ill or suffers from psychological problems. Always wash hands thoroughly with soap and water before touching kittens to avoid introducing germs. Begin handling and stroking kittens regularly (but for just a couple of minutes at a time) during the second week. Gradually increase handling times as kittens grow older. Hold kittens very near the nest, within view of their mother. Supervise older children’s interactions with kittens and don’t allow very young children to handle them (clumsy handing can easily kill a small, fragile kitten). Don’t attempt to handle kittens if the mother doesn’t appear calm and relaxed. If the mother shows any signs of agitation when a kitten is removed from the nest, return the kitten immediately.